This two-and-a-half day live symposium, which is the twelfth in an annual series, will be designed to present and discuss the diagnosis and treatment paradigms for aortic diseases, including medical, endovascular, surgical, and hybrid options. A faculty of leading experts from around the world will present and debate many important topics in aortic disease today. View the 2019 brochure and scientific agenda! 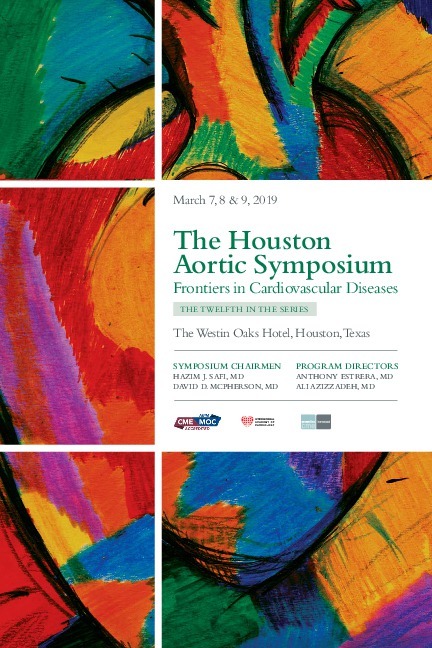 Second Annual Houston Aortic Nursing Symposium, Wednesday, March 6, 2019 | 12:00 – 5:00 PM View the nursing symposium website! The symposium is designed for cardiac surgeons, cardiologists, vascular surgeons, internists, family practice physicians, anesthesiologists, cardiac nurses, nurse practitioners, physician assistants, residents, and other healthcare professionals involved in the care and treatment of patients with cardiovascular diseases. Promedica International is accredited by the Accreditation Council for Continuing Medical Education (ACCME) to provide continuing medical education for physicians. Promedica International designates this live activity for a maximum of 16.5 AMA PRA Category 1 Credit(s)™. Physicians should claim only the credit commensurate with the extent of their participation in the activity. Provider approved by the California Board of Registered Nursing, Provider #8495 for 16.5 contact hours. 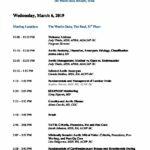 The American Board of Cardiovascular Perfusion (ABCP) has approved 17.66 Category 1 CEUs to perfusionsts who attend the symposium, for Thursday, March 7 (7.40), Friday, March 8 (7.4), and Saturday, March 9 (2.86). Successful completion of this CME activity, which includes participation in the evaluation component, enables the participant to earn up to 16.5 Medical Knowledge MOC Points and Patient Safety MOC credit in the American Board of Internal Medicine’s (ABIM) Maintenance of Certification (MOC) program. Participants will earn MOC points equivalent to the amount of CME credits claimed for the activity. It is the CME activity provider’s responsibility to submit participant completion information to ACCME for the purpose of granting ABIM MOC credit. For interested parties, there is a two hour walking tour of the UH Art & Architecture taking place on Saturday, March 9th from 10:00 am – 12:00 pm. If you are interested in further information on the cost to join the tour, how to register, and where to meet the tour, please visit the website: https://aiahouston.org/v/event-detail/UH-Art-Architecture-Tour-March-9/1e1/. This tour is separate from and not affiliated with the symposium. The group reservations deadline has passed and currently the Westin Oaks is sold out over the night of March 6th. If you need a reservation for dates that do not encompass March 6th, please contact Rebecca Law for information on current availability. All cancellations must be submitted in writing and refunds will be subject to a $100 administration charge. Cancellations cannot be accepted over the telephone. Refunds will not be available after January 25, 2019.